For hiking and backpacking you need good boots which protect your feet from injuries and improve your performance on trails by providing you with support, stability and traction. Because hiking boots vary greatly in weight, breathability and comfort you should choose them according to the conditions you expect to encounter on your trips. If you rarely carry a heavy backpack or do technically demanding hikes, hiking boots are a great option. 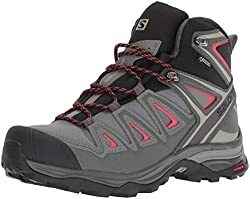 However, for technically demanding hikes and hiking with a heavy backpack you will need more robust backpacking boots that provide better ankle support, durability and stability. In the following we selected the best boots for hiking and backpacking. We split this selection in two parts; backpacking boots and hiking boots. The What is important section below will help you decide which type of boots is right for you. 1. 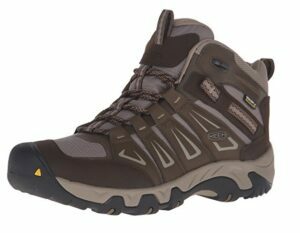 Buying Boots for Hiking or Backpacking – What is important? 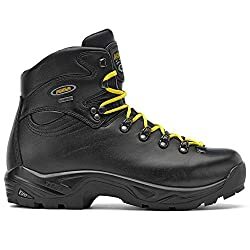 These boots are perfect for multi-day adventures with a heavy backpack and mountain climbing on rocky terrain because they provide good ankle support and offer high level of abrasion resistance. Furthermore, they are also a good for winter hiking because they can usually be used with snowshoes or C1 crampons (strap-on bindings). 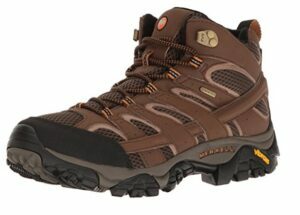 These boots are best for lightweight hiking on easy and moderate trails (dirt tracks, paths and muddy/grassy trails). They are very comfortable to wear but we don’t recommend them for rough terrain as they don’t provide good enough abrasion resistance and support. The weight of a boot depends on the materials. The sole and the upper have the biggest impact on the weight. Weight is important as it has impact on your performance and comfort level. The lightest the boots, the easier you will hike. Backpacking boots are due to their better support and durability usually heavier than hiking boots. Boots for hiking and backpacking have uppers made of leather, combination of leather and synthetic materials or only synthetic materials. Synthetic uppers have certain advantages such as being lighter and more breathable than leather uppers. However, leather uppers provide better durability, abrasion-resistance and ankle support (leather is more rigid than synthetic materials). Leather comes in different forms such as full-grain leather, split-grain leather and nubuck leather. Learn more about different types of leather in our Guide to Hiking Footwear. The lining is the fabric on the inside of the boot. The lining should be breathable and moisture-wicking to keep your feet comfortable. Waterproof boots utilize a waterproof/breathable lining such as Gore-Tex, which keeps your feet dry in wet conditions. Note that waterproof lining reduces the breathability of boots. We don’t recommend buying waterproof boots if you don’t need them. The insole (footbed) should be moisture-wicking and breathable. Insoles are usually treated with antimicrobial agents for prolonged freshness. The midsole provides cushioning and support. 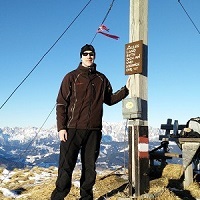 Therefore, it is one of the most important components of a hiking boot. Midsoles are made either of EVA (ethylene vinyl acetate) or PU (polyurethane). EVA midsoles are lighter and more flexible than PU midsoles. Therefore, they are used for running shoes, trekking shoes and hiking boots for easy trails. Backpacking boots usually have PU midsoles for better stability on rocky terrain and for carrying heavy loads. PU midsoles are also more durable than EVA midsoles; they don’t get “flat” as fast as EVA midsoles. The outsole provides traction. The deeper and thicker the lugs, the better traction it provides. 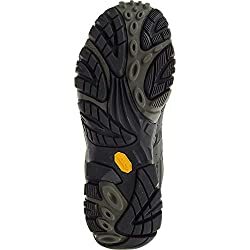 Some brands develop their own outsoles like for example Salomon (Contagrip) while others use outsoles from specialized manufacturers such as Vibram. Weight (pair) 3 lbs. 4 oz. 2 lbs. 7 oz. 3 lbs. 9 oz. 2 lbs. 12 oz. 2 lbs. 13 oz. The Zamberlan Vioz GT backpacking boots are very comfortable and perfect for backpacking and mountain climbing on rocky terrain. The boots feature rugged and durable full-grain leather uppers for good abrasion resistance and Gore-Tex lining to keep your feet dry in wet conditions. 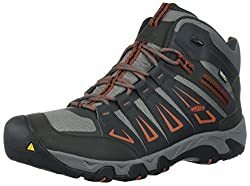 The midsole is made of polyurethane and thus the boots offer a great level of comfort when you are carrying a heavy backpack or hiking on technically challenging rocky trails. The midsole is also equipped with back stabilizers for better stability and support. The Zamberlan boots feature Vibram 3D soles with widely spaced thick lugs which offer excellent traction, downhill braking and easy removal of dirt. Even though the boots are relatively stiff, flex forward is not limited due to the Zamberlan Flex System. The Zamberlan Vioz GT boots are a great option for those who need a pair of very durable boots for long backpacking and mountaineering trips on uneven terrain. 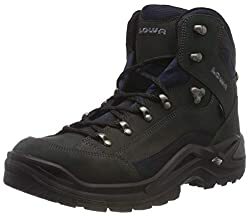 The Lowa Renegade backpacking boots are lighter (merely 1 pound or 515 grams per boot) than the Zamberlan boots above, but on the other hand they don’t have as durable uppers. 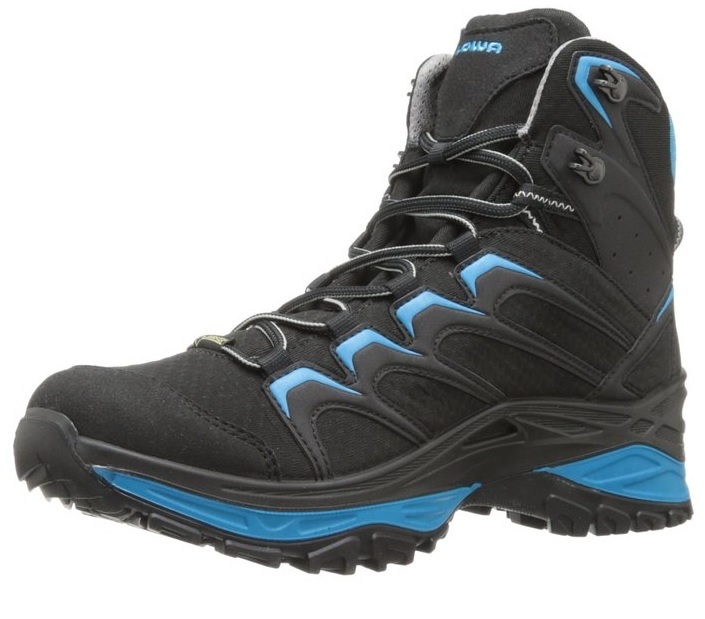 The Lowa Renegade boots can also be also used comfortably and efficiently on easier trails, due to their low weight. The upper is made of nubuck leather and provides great breathability. Gore-Tex lining is placed beneath the upper and keeps your feet dry in wet conditions. The Lowa Renegade boots are also equipped with Climate Control insoles and dual density polyurethane midsoles. Traction is ensured by the Vibram Evo outsole which, due to its unique lug pattern, provides great performance on different terrain types. The Lowa Renegade boots are best for those who need a versatile pair of high-quality boots for different outdoor adventures. 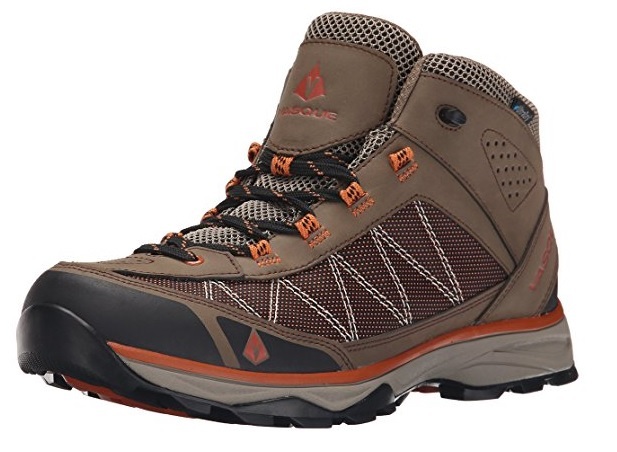 The Asolo TPS 520 GV backpacking boots are very robust and thus they provide great durability. However, they are also the heaviest boots in this review. The boots are equipped with uppers made of water-resistant full-grain leather with thickness of 2.7 millimeters. Therefore, they are perfect for hiking on rocky terrain where abrasion resistance is a priority. As the leather is relatively rigid, they also provide great ankle support. The Asolo TPS 520 GV boot features Gore-Tex lining for increased weather protection and a high-quality TPS sole. The midsole is made of polyurethane while the outsoles are manufactured by Vibram. There are three cylinders inside the sole for better shock absorption and stability. The Asolo TPS 520 GV boots are perfect for long backpacking trips and mountaineering on rocky terrain. The Salewa Mountain Trainer boots are designed for technical hiking and via ferrata climbing. However, they can also be comfortably and efficiently worn on long backpacking trips where you need good ankle support. The Salewa Mountain Trainer boots feature uppers made of nubuck leather, which provides good breathability. The boot is protected against the abrasion with an all-around rubber rand. There are also rubber inserts (3F System) in the ankle area for increased ankle support. The lacing comes right to the toe (climbing lacing) for a more precise fit when doing technically challenging trails. The boots also feature Gore-Tex lining and Vibram Alpine Approach outsoles. 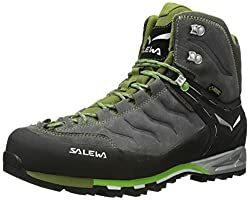 The Salewa boots are lighter than Zamberlan and Asolo boots mentioned above but on the other hand provide slightly less abrasion resistance and durability. Nevertheless, they are a great option for fast paced backpacking and mountaineering. 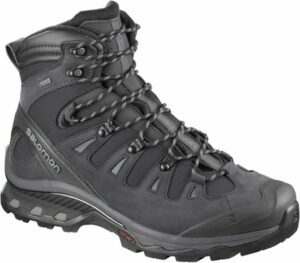 The Salomon Quest 4D 3 GTX backpacking boots are relatively lightweight and therefore very comfortable to wear. The boots feature uppers made of a combination of leather and synthetic materials, and therefore provide great breathability. 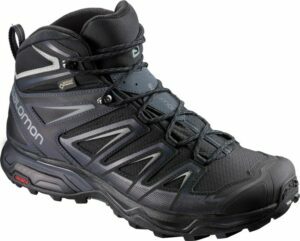 The Salomon boots are also equipped with Gore-Tex lining, EVA midsoles and Contagrip outsoles. The Contagrip outsole is made of elements with different densities – areas that are prone to wear out (like the heel and toe area) are made of high-density materials, while the less exposed areas are made of low-density materials. Such a construction design reduces the overall weight of the boot without comprosing its durability. 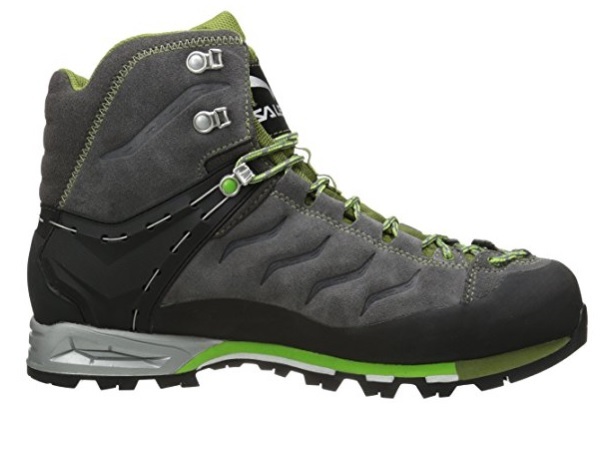 Additionally, the Salomon Quest 4D 3 GTX boot also features a 4D chassis for better support and stability. Weight (pair) 2 lbs. 1 lb. 16 oz. 2 lbs. 1 oz. 2 lbs. 2 lbs. 2 oz. 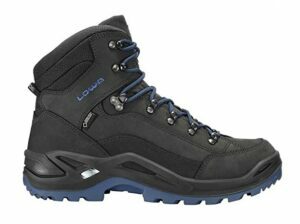 The Lowa Innox Goretex Mid hiking boots do not only look incredibly good but are also very comfortable and breathable. They differ from the other boots listed in this selection by having polyurethane midsoles. Therefore, they provide great support and cushioning not only on dirt tracks but also on rocky trails. The upper is made of lightweight synthetic material and the boots are additionally reinforced with rubber in the crucial areas. These rubber reinforcements increase the durability of the boots as well as provide support in the ankle area. This Lowa boots use Gore-Tex lining to keep your feet dry in rainy weather and are equipped with Lowa NXT outsoles. The Lowa Innox Goretex Mid are perfect for lightweight hiking and trekking. Due to the dual density polyurethane midsoles they can be also worn for mountaineering. However, the synthetic upper should be protected from abrasion as it doesn’t provide as good durability as for example leather. 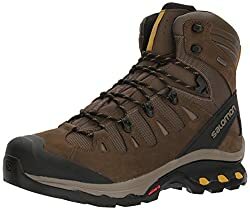 The Salomon X Ultra Mid 3 GTX boots are also a great option for lightweight hiking and trekking. Like the Lowa Innox, the Salomon X Ultra Mid 3 GTX boot also features a synthetic upper which is breathable and quick-drying. The upper is reinforced with rubber panels for better durability and ankle support. The tongue of the boot is connected to the upper to prevent dirt from entering. The Salomon X Ultra Mid 3 are equipped with Contagrip outsoles which are made of materials of different densities. Areas that are prone to wear out (like the heel and toe area) are made of more durable (high-density) materials, while the less exposed areas are made of materials with lower densities to ensure the optimal balance between weight and durability. The Salomon X Ultra Mid 3 GTX boot is also equipped with an EVA midsole, an anatomically shaped footbed, Gore-Tex lining and protective rand. The Keen Oakridge Waterproof boots are, like the Lowa and Salomon products above, perfect for lightweight hiking. The upper is made of leather and mesh fabric. The leather protects the boot from abrasion while the mesh fabric provides breathability. 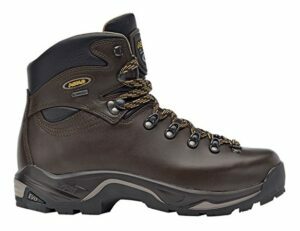 The Oakridge boots are lined with Keen.Dry and are therefore water-resistant. The boot also has an anatomically shaped footbox which provides excellent arch support and good fit. Additionally, the Keen Oakridge boots feature NXT treatment for odor-control and Keen outsoles with 4 millimeters deep multi directional lugs. Therefore, they provide good traction on grassy and muddy trails. The Keen Oakridge Waterproof are a great option for those who want a pair of relatively inexpensive boots for different outdoor adventures. 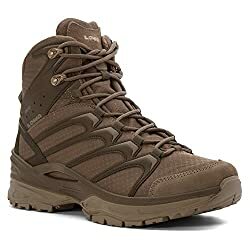 The Vasque Monolith Ultradry hiking boots are perfect for fast paced hikes as they are lightweight and very comfortable. The boot has a synthetic upper which is reinforced with nubuck leather panels for better durability. Beneath the upper, the Vasque Monolith boot features UltraDry lining to keep your feet dry while you are hiking on wet terrain. 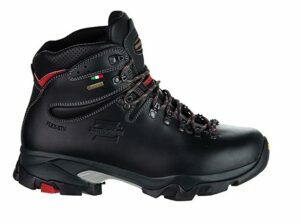 The boots are also equipped with EVA midsoles and Vasque Monolith outsoles for good traction. The boots utilize midfoot stabilizers (made of polyurethane) for better stability and cushioning on uneven terrain. The Vasque Monolith Ultradry are relatively inexpensive and thus perfect for beginners and those on a tight budget. All in all, they are great for the price. The Merrell Moab 2 Mid GTX boots provide good durability as they have synthetic leather uppers and protective rubber toe caps. Nevertheless, parts of the upper are made of mesh fabric for better breathability. This Merrell boots also provide good protection against the weather due to the Gore-Tex lining. They are equipped with Vibram outsoles which feature 5 millimeters deep lugs for good traction on muddy trails. In the heel area the boots feature Merrell air cushion system for better shock absorption and stability. The midsole is made of EVA foam and thus provides good flexibility for fast hiking. All in all, the Merrell Moab 2 Mid GTX is a great pair of boots for the price. 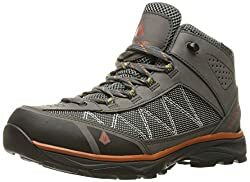 Can I wear running shoes for backpacking/hiking? We don’t recommend wearing running shoes for backpacking because running shoes don’t provide ankle support and their midsoles are not durable enough to withstand the weight of a heavy backpack. Furthermore, synthetic uppers might start tearing on rough terrain. How do you break in backpacking/hiking boots? Before going on a long trip, wear your boots for everyday errands for several days. Note that if the boots don’t feel comfortable after several days of around-the-town use, they probably don’t fit you well. It really depends on the expected weather conditions. Waterproof boots will keep your feet dry in rainy weather, but they don’t provide as good breathability as boots without waterproof lining – which means that you are more likely to sweat in waterproof boots in warm weather.